The connected (smart) street lights market is primarily driven by the ability of connected (smart) street lights to address the imperfections of traditional street lights. Traditional lighting systems which are at present the de facto standard for street lighting is associated with configuration challenges, extraordinary cost, and interoperability issues that connected (smart) street lights can address. Apart from this, the development of smart cities across several countries around the world is leading utility companies and government institutions to look for smart lighting technologies that can help reduce costs, reduce carbon emissions, and help boost overall efficiency. Smart (connected) lighting systems can substantially reduce energy consumption as it can be incorporated with various sensors such as natural light sensors occupancy sensors, and motion sensors. With the moderate pace of advancement of technologies that are used in connected (smart) street lights and the incessant demand for sustainable lighting solutions has led to considerable penetration of connected (smart) street lights across several cities in developed regions. A report by Transparency Market Research forecasts the global connected (smart) street lights market to display an outstanding 16.0% CAGR in terms of revenue over the forecast period between 2017 and 2025. The market was evaluated at US$3,712.5 mn in 2016. Vis-à-vis volume, the global connected (smart) street lights market is likely to expand at a CAGR of 20.1% from 2017 to 2025. 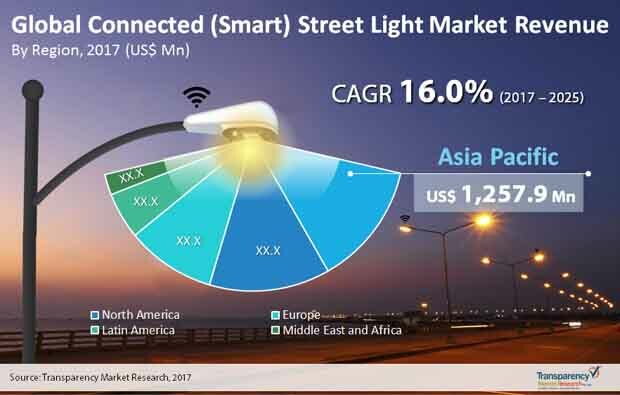 The report studies the global connected (smart) street lights market on the basis of connectivity, component, and geography. On the basis of connectivity, the global connected (smart) street lights market is bifurcated into wired and wireless. The segment of wired connectivity includes various wireless technologies, whereas wireless connectivity includes power line communication. Of the two, wireless connected (smart) street light segment accounts for a significant share of the global market. Going forward, the share of wireless connected (smart) street light segment is expected to further grow in the overall market. The segments of the global connected (smart) street lights market depending upon component are hardware, software, and services. The segment of hardware is further sub-segmented into sensors, controllers/relays, and others. The global connected (smart) street lights market by geography is studied across North America, Asia Pacific, Europe, South America, and the Middle East and Africa. Amongst all, Europe presently holds the leading share in the global connected (smart) street lights market followed by North America. Utility companies and government agencies in these regions have gauged the advantages of connected (smart) street lighting solutions for reducing energy consumption that has economic benefits. Moreover, regulations and energy policies strictly in place in to limit energy consumption are boosting the adoption of connected (smart) street lights in these regions. The adoption of connected (smart) street lights also addresses the cost factor of traditional lighting to some extent which is high in Europe and North America. Asia Pacific is expected to display the leading CAGR of 18.6% on the basis of revenue between 2017 and 2025. The growth in this region is driven by the increasing demand for LEDs in a bid to reduce energy consumption and to reduce overall operational costs. China and India are expected to emerge as key domestic markets that will contribute substantially to the overall growth in Asia Pacific. Prominent participants in the global connected (smart) street lights market are Acuity Brands Lighting Inc., EnGo PLANET, Schreder Group, Telensa Ltd., Twilight Citelum S.A., Flashnet SRL, OSRAM Licht Group, Toshiba Lighting, Dimonoff Inc., General Electric Co., Philips Lighting N.V., Echelon Corporation, Led Roadway Lighting Ltd, and Silver Springs Network Inc. This report on the global connected (smart) street lights market provides analysis for the period 2015–2025, wherein 2016 is the base year and the period from 2017 to 2025 is the forecast period. Data for 2015 has been included to provide historical information. The report covers market dynamics including drivers, restraints, opportunities, and trends expected to influence the global connected (smart) street lights market growth during the said period. Technologies that are playing a major role in the driving the global connected (smart) street lights market have also been considered in the study. The study provides a comprehensive analysis of the market growth throughout the above forecast period in terms of revenue estimates (in US$ Mn), across different geographies. The report also includes key industrial developments in connected (smart) street lights market. Porter Five Force analysis which identifies bargaining power of supplier, bargaining power of buyer, threat from new entrant, threat from substitute and threat from competition in connected (smart) street lights market is also included in the report. Ecosystem analysis which identifies key stake holders in the connected (smart) street lights market is also covered in the report. Segment trends and regional trends have also been added in connected (smart) street lights study. Additionally, the report also covers segment wise comparison matrix, market attractiveness analysis and market positioning of key players for all regions covered in the scope of study. Comparison matrix includes segment growth matrix, 2017 - 2025(%), segment revenue contribution, 2017 - 2025 (%), and segment compounded growth matrix (CAGR %). Market attractiveness identifies and compares segments market attractiveness on the basis of CAGR and market share index across North America, Europe, Asia Pacific, Middle East & Africa (MEA), and South America. The connected (smart) street lights market has been segmented on the basis of connectivity, by component, and by region. Based on connectivity type, the market has been further classified into wired and wireless. By component, the connected (smart) street lights market is classified into hardware, software and services. Geographically, the report classifies the global connected (smart) street lights market into North America, Europe, Asia Pacific (APAC), Middle East & Africa (MEA), and South America; the regions are analyzed in terms of revenue generation. Furthermore, region wise prominent countries covered in the report include the following - U.S, Canada, U.K., Germany, France, Japan, China, India, South Korea, GCC countries, South Africa and Brazil. Furthermore, the report includes competition landscape which comprises of competition matrix, market share analysis of major players in the connected (smart) street lights market based on their 2016 revenues, and profiles of major players. Competition matrix benchmarks leading players on the basis of their capabilities and potential to grow. Factors including market position, offerings and R&D focus are attributed to company’s capabilities. Factors including top line growth, market share, segment growth, infrastructure facilities and future outlook are attributed to company’s potential to grow. This section also identifies and includes various recent developments carried out by the leading players of connected (smart) street lights market. Company profiling includes company overview, major business strategies adopted, SWOT analysis, and market revenues for year 2014 to 2016. The global players profiled in the global connected (smart) street lights market include Acuity Brands Lighting, Inc., Citelum S.A., Dimonoff Inc, Echelon Corporation, EnGo PLANET, Flashnet SRL, General Electric Co., Led Roadway Lighting Ltd., Schreder Group, OSRAM Licht Group, Philips Lighting N.V., Silver Spring Networks Inc., Telensa Ltd. , Toshiba Lighting, Tvilight have also been added in the report.